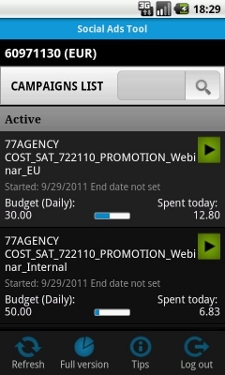 If you are Android device owner and using Facebook Ad Management system to manage your Ads Campaign and wants to track your whole ad campaign 24/7 without having your personal computer or full browser access than you can do it by using Android Application from your device. Social Ads Tool has launched an entirely new Android App which helps users to manage Facebook Ad Campaign from android devices. The App is called a light version of its web-based offering, “geared toward keen Facebook ads managers who want to keep an eye on their campaigns quickly and without the need for a full web browser.” According to 77Agency developers the app contains whole new features like budget, bidding, and status editing functions to devices and also provides security features to thwart unwanted access, and it also offers tips on best practices. The Android App for Facebook Ad Campaign is available via Android Market at free of cost. Grab it and manage all your Facebook ad campaign now.